A Detergent with Something to Hide? 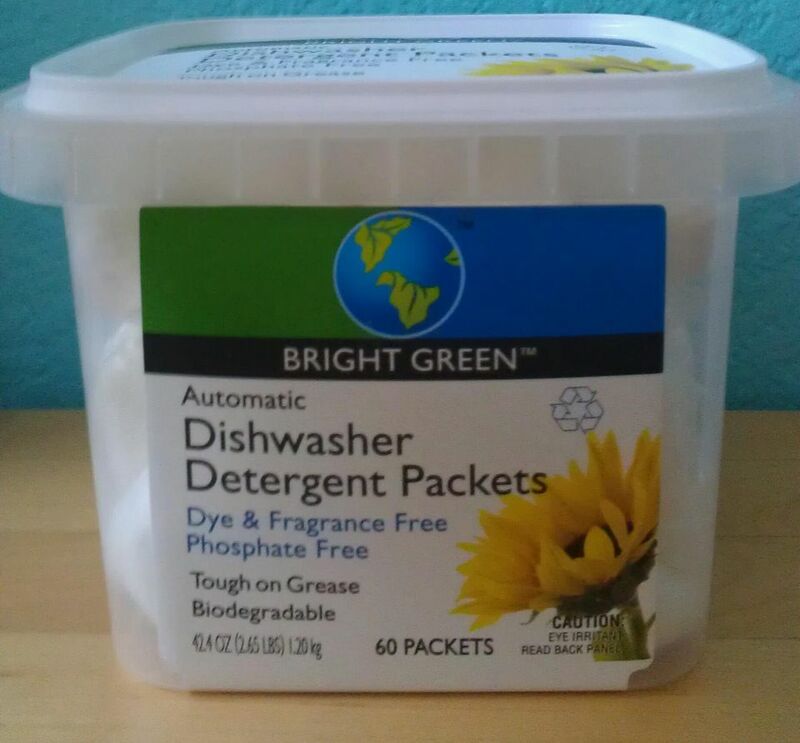 This fragrance-free, automatic dish detergent comes in handy, pre-measured packets, which made it super easy to use. However, I didn't find it completely effective when testing it in hard water conditions and I wasn't happy to discover a lack of company transparency. Read on for more details. Size: 60 packets total; 42.4 oz. (2.65 lb.) 1.20 kg. Bright Green is a Safeway and Vons brand of high-efficiency light bulbs and environmentally friendly cleaning, laundry, and paper products. It is distributed by Lucerne North America, LLC, a subsidiary of Lucerne Foods (fdba Omnibrands), Inc. Safeway's website notes the brand was developed in partnership with Scientific Certification Systems (SCS), a third-party environmental, sustainability, and food quality certifier, auditor, and tester. All the cleaning products are made with naturally derived and biodegradable ingredients. More about the Bright Green brand can be found on Safeway's website. This convenient product contains 60 pre-measured packets that are very easy to use. Simply place one in the main dispenser cup in your dishwasher and close. The water will release the contents of the packet. The manufacturer notes that this product is tough on grease, which is true. It easily removed grease and grime from dishes. However, it notes that for best results to add its dishwasher rinse-aid to help with spots and film. I didn't have the Bright Green rinse-aid, so I used vinegar instead, but I still had problems with spotting on my glasses. Perhaps the Bright Green rinse-aid would have worked better. Nevertheless, I would strongly recommend using a green rinse-aid if you have hard water. The ingredients are not listed on the product label. The only reference to what it may contain is this statement on the label: "Made from naturally derived nonionic surfactants and citric acid (derived from sugar)." Well, this isn't enough information. For Bright Green to truly claim it's green, it should be fully transparent and list the ingredients. Also, the MSDS is nowhere to be found on the company website. The label cautions to keep the product out of the reach of children, to avoid eye contact, and to not ingest the product. First-aid measures suggest flushing the eyes with water for at least 15 minutes if eye contact occurs and to seek medical attention if irritation persists. If the product is swallowed, the label states to not induce vomiting, but seek medical attention. This biodegradable product contains no petroleum solvents, dyes, fragrance, volatile organic compounds (VOCs), or phosphates according to the product label. This all sounds good, but none of the ingredients are listed so it's difficult to accurately evaluate the environmental friendliness of this product. The packaging is recyclable and made from 25% post-consumer waste. This product sounds green, but it is truly difficult to recommend it as an eco-friendly product because the ingredients are not listed on the product label and the MSDS is not available on the website. Therefore, due to the lack of company transparency, I had to knock off a few stars.